More Information What is Self-Management? Self-management is a philosophy of health whereby it is believed that the individual has the knowledge, skills, judgment, ability and confidence to be an advocate and expert in the management of his/her own health and wellness (Lorig et al., 2006). Self-management education is an important part of chronic disease care and is an important first step in providing patients with the information they need to manage their health. Self-management relates to the tasks that an individual must undertake to live well with one or more chronic conditions. These tasks include gaining confidence to deal with medical needs, everyday roles and responsibilities, and emotional issues. •	Belief that it is generally easier to add a new activity than to stop or cut down on an activity. Self-Management is a tool that can help patients improve their quality of life while living with one or more chronic conditions. It is evidence-based and can be part of continuum of care. Furthermore, about half of all Canadians live with one or more chronic conditions. While healthcare professionals take charge of acute conditions, on a daily basis it is patients who manage the symptoms, treatments, emotions, and impact of their chronic conditions. They make lifestyle changes, such as diet, exercise, or stress management, which are typical self-management health behaviours and can be strengthened in an evidence-based workshop delivered by trained facilitators. More Information What is a Self-Management Program? Self-Management programs provide evidence based learning for people living with one or more chronic conditions. The program was developed by Stanford University’s Patient Education Research Group and has been actively implemented in over 35 countries. A Self-Management program takes place in 2.5 hour long weekly sessions over 6 weeks and is widely considered a best practice in chronic disease self-management. The Self-Management program is a peer-led model for promoting healthy behaviour change. Peer support among persons with the same chronic health problem may be especially effective, combining the benefits of both receiving and providing social support. As such, workshops are delivered by peers who can help engender healthy behaviour change in participants. More Information How is the Self-Management Program part of the continuum of care? Self-Management program is a licensed program from Self-Management Resource Centre. This program follows a standardized process that has proven to help people learn to better manage the symptoms of living with chronic health conditions. The program does not conflict with existing programs or treatment. Treatment is not altered. For medical questions, participants are referred to their health care provider. This program is part of the the expanded chronic care model in health and social services. The program is led by peers instead of health care providers and is always provided in a group setting. Program participants will engage in peer-led discussion on topics such as emotional changes, healthy eating and physical activity, working with their healthcare team, symptoms such as fatigue and pain, and will reflect on their role in their disease management. More Information What is Diabetes, Healthy Feet, and You? Diabetes, Healthy Feet, & You focuses on health education that helps prevent foot ulcers. The 2.5 hour workshop shares essential foot care information to individuals with diabetes to help address diabetic neuropathy. More Information How can I engender Self-Management behaviour in patients? As a health care provider, you can learn effective communication skills that promote healthy behaviour change in your patient(s). 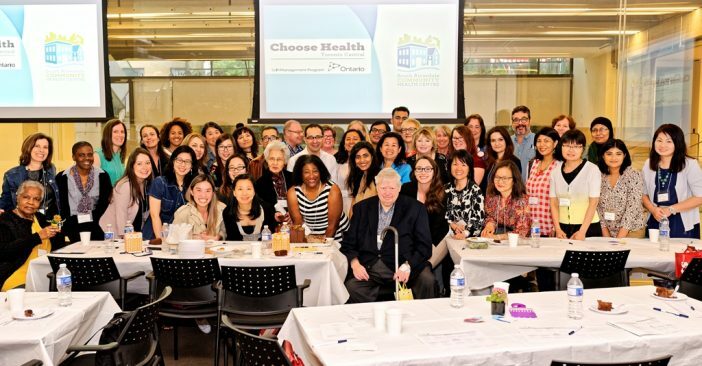 To support you, Choose Health Toronto Central offers free workshops developed by the Institute for Health Care Communication-Canada for health care providers with the intended goal of assessing and improving confidence and conviction in engendering self-management behaviour change among patients. For more information, visit our Health Care Provider pages. More Information What is a Chronic Condition? Chronic diseases are long-term diseases that develop slowly over time, often progressing in severity, and can often be controlled, but rarely cured. They include conditions such as cardiovascular diseases (heart disease and stroke), cancer, diabetes, arthritis, back problems, asthma, and chronic depression. Chronic diseases may significantly impair everyday physical and mental functions and reduce one’s ability to perform activities of daily living.